Can Killing Virtual Trees Save Real Paper? Yes, says Stanford. We’re not so sure. The study comes out of Stanford’s Virtual Human Interaction Lab, which has set as its goal to learn more about how virtual experience affect real-life behavior. The lab is headed up by Jeremy Bailenson, who has written a book called Infinite Reality: Avatars, Eternal Life, New Worlds, and the Dawn of the Virtual Revolution. It’s his belief that as our lives become more media-saturated, the instructional pamphlet no longer does the job. Instead, we need head-mounted video devices, 360-degree immersive virtual environments, and “haptic” (touch-feedback) sensors. Stanford’s Sun Joo Ahn, a Ph.D. student, designed a study wherein one group was given vivid reading material about deforestation and what happens when you sink a chainsaw into a tree. Another group underwent the full VR treatment, though; they put on a VR helmet and ventured into a virtual woods. 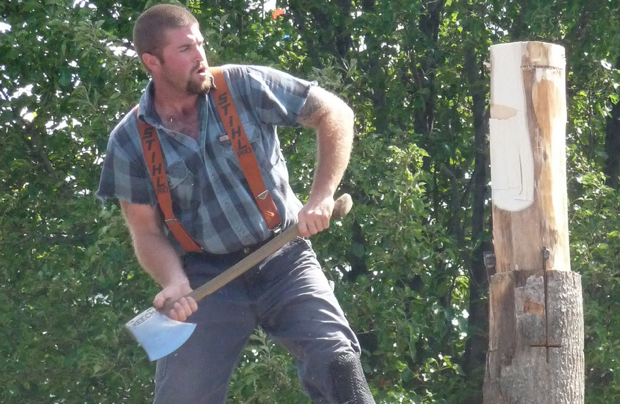 They used a device with touch feedback to simulate the back-and-forth motions of cutting down a tree, and heard the buzzing and cracking sounds involved in real-life lumberjackery. What came next was intriguing. Both groups–the non-VR and the VR group–said they had a deeper understanding of deforestation and a deeper commitment to altering their behavior accordingly. But while the non-VR group talked the talk, only the VR group walked the walk. Ahn displayed this through a bit of psych-student trickery. While debriefing the students, she placed a glass of water and some napkins on a table. Then she “accidentally” knocked over the cup of water, and the students politely seized napkins to mop up the mess. Ahn later counted up how many napkins were used–and the VR group used fewer. Personally, we’re a tad skeptical of the interpretation behind these findings. Psych experiments sometimes have a way of becoming overly ingenious. Does volume of napkin usage really tells us what we need to know here about a person’s inner state or deep beliefs? Besides, was each spill absolutely identical–in terms both of the number of millileters in the glass to begin with, and the amount that actually poured out? Spill volume, or perceived spill volume, seems to us the highest predictor of how many napkins a subject would reach for. Are the results adjusted for the thickness and nimbleness of the subjects’ fingers, which seem a significant factor in how dexterously one can grab just the appropriate amount of toweling needed to mop up a spill? A few other quibbles: If simulating the felling of a tree yields pro-environmental behavior, then why aren’t lumberjacks, who actually do the dirty work, the greatest environmentalists of all? Is Ahn’s experiment specifically concerned with preaching to the choir, turning Bay Area sentiment into Bay Area behavior? We’re all for more virtual reality, and are excited by Stanford’s plans to transform its VR center into something like an IMAX “on steroids.” (“The next time a tree crashes,” Bailenson said, “it will shake your boots.”) And not to say that there aren’t real psychological lessons to be drawn from VR, but we’re not sure that this particular study tells us as much as it claims. For now, we’re still calling science science, and entertainment entertainment.